REMEMBER EVERYONE IS GETTING LOW ON GLOW BUGS SO PUT YOUR ORDERS IN NOW, "SELLING QUICK DON'T LEAVE IT TO LATE"
All Rivers are fishing great Eucumbene, Thredbo, Tantangara. All rivers are up and running after all the rain on the weekend things are looking good. This is the last weekend coming up so if you're looking for that big brown this is the time. 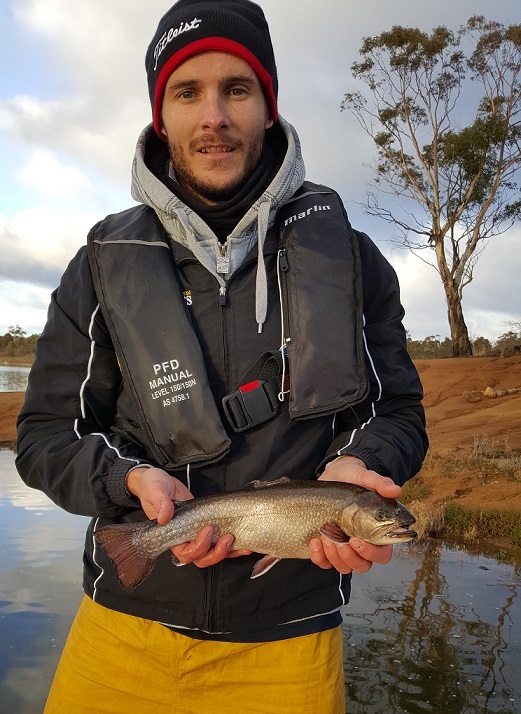 Reports are coming in thick and fast the Eucumbene, Thredbo, Tantangara are fishing really good so do not leave it to long all rivers close this Monday night the 13th. What can i say but if your not up there fishing you will miss out on the best fishing we have had for months, remember the river is for everyone so have a good time gets some good photo’s get the fish back into the water as quick as possible good luck!! Even though it was very wet, we spent long hours on lake Jindabyne's waste point on Friday, Saturday and Sunday. Brown was very active on hard body loures and soft plastics. Powerbait and Gulp was effective all day for rainbows. Branko scored a beautiful 42cm Brook trout. Joey's 54cm brown with the J7 Rapala Brown Trout still in its mouth was the bigger of 3 over the past 3 days. The third one hit a soft plastic. Finally the Lake level has stabilized a bit with a much slower draw down recently, only a slight variation to last week and it is currently hovering around 37%, there are still wide expanses of mud and soft clay so anglers need to be extra careful when traversing the banks and launching their boats. The boat launching area at Braemar is very very slippery and boggy, this area should be avoided until further notice, if you get stuck there is no one on hand to help you !!!!!! As advised in previous reports, the access road through the Park and down to the water will be closed for a period of approximately 5 weeks, any vehicles or visitors coming to the Park must report to the shop before entering the Park, heavy machinery and road equipment will have complete access to this area and there is a strong possibility you will not be able to get out, there are no suitable alternate routes to the water apart from the Snowy Hydro track at the back of the Park which is suitable for pedestrian access only, drive to the water at your own risk. The fishing was reasonably good last week, there were several visiting groups from Victoria and locally, the trolling was very good on the windy days, with one group of 4 boats catching 53 fish in 6 hours, there were quite a few throw backs amongst the catch but several nice rainbows up to 1220 gms and a brown of 1300 gms, 9 fish were kept and the rest released between the 7 anglers. Best tassies were # 56 # 28 and # 94.